• ISM on track to be the 2nd UWC in Africa! The last few days I have been in Dar meeting with different groups. During this time, I have met with some parents of current students; potential parents and students; and alumni. It was an interesting visit as you get to hear a lot about what people say about ISM. One thing that will stay with me is how strongly our alumni feel connected to the school and each other. They told me about different gatherings alumni groups have attended all over the world and we discussed plans for the 50th anniversary weekend at the end of July 2019. It is amazing to see such strong connections that have been maintained over both distance and time. As we are planning the events for the 50th celebration, we would like to make sure that we connect with alumni all over and solicit as much input as possible for these events. If you would like to be involved, please contact Mwegelo who is leading the planning. This last week you should have received an email with a link to the CIS Community Survey. This is an opportunity for all members of the community to get involved and share their thoughts. It would be the first one in four years and we really do need as many people as possible to fill this out, so we get the best picture we can to help continuously improve the school. One last note is that Maulid is now officially listed as Tuesday November 20th. It was provisionally on our school calendar as the 21st, so please make note of the change. There are no classes that day. ISM on track to be the 2nd UWC in Africa! On 28th October 2018, ISM was granted preliminary approval to join the United World College movement. This has come on the back of a lot of hard work over a number of years so congratulations must go to all members of our ISM community, past and present. The final stage of the process is final approval and ISM will be seeking final approval at the next UWC International Board meeting in March 2019. ISM Arusha Campus will open as a residential school in August 2019. Construction of a student residence with capacity for 32 students has already started. The School Leadership and faculty has already started planning for increased staffing on both campuses. ISM is on track to open in August 2019 as the only UWC in East Africa. Please email me, annamarsden@ed.ismohi.com, with any questions. We are also working on a UWC Frequently Asked Questions section for the school website. More details of this will be in next week’s newsletter. On Tuesday we have our next Coffee Morning. It will start with a presentation by Cathy Wambua-Saha on the enhancements that the IB is making to the PYP. Ben and myself will also be there to chat about events around campus. Everyone is welcome and we hope to see you at the Social Center at 7:45am. Right now, they will be in Rafiki Hall unless the space is needed by teachers/students. It would be helpful if people could donate for the sessions to help support its continued offering. Marissa is a 200 hour Certified yoga teacher and a 100 hour certified Children’s yoga teacher. She uses her yoga to help students re-pattern their bodies and minds and relieve stress from daily living. She has spent the past 4 years bringing yoga and mindfulness tools to youth in Brooklyn, NY and is so grateful to now be in Moshi offering this practice to many more. With an alignment based, trauma informed sequence, Marissa hopes to provide students with a feeling of “coming home” to their bodies, minds, and hearts. On Saturday mornings Jaimie Stratton and Marieke Dekker have a fun running activity that is open to students and community members. It starts at 7:30am at the picnic tables near the fields and is a 5-kilometer around the campus perimeter on a beautiful trail, now lined with jacaranda blossom. All are welcome. ISMers, do not forget the cross fit type session every Tuesday and Thursday mornings from 5:40am to 6:20am. Cross fit involves interval timing exercises which use body weight or low weight items to give you a whole-body workout with minimal impact on joints and ligaments. It is designed for everyone as all exercises are adaptable, so they can be done by someone who has never really worked out before or by professional athletes. The preparations are under way, led by our intrepid MD Mary Pantlin and our very own DD Mr. George Juma! …and don’t forget the choir! Our full primary from P1 to P6 will be singing their hearts out in a performance they may remember for the rest of their lives. We are lucky to have such a dedicated team of professionals and volunteers working and giving up their time and personal donations of money and materials… but we can’t do it alone!!! In order to have the choir looking ‘smart as a whistle, sharp as a thistle’ on the performance nights we’ll be asking (as last year) for you to make a donation of 15,000 to cover the costs of producing a fabulous good quality shirt with the play logo for each choir member. The children will wear these for the performances (and then of course keep as a commemorative reminder of this fantastic shared experience!). If making a donation is something you are not comfortable with, for whatever reason, please contact Ben Morley or Bob Cofer this week to discuss alternative options. For teachers, one of the lasting benefits of an all-through school is that it promotes an ongoing dialogue about learning across the different phases, which otherwise would remain separate. On the ISM staff, we are lucky to have a pool of staff experience and expertise that spans the whole learning spectrum which is of huge value to any school. At ISM, every member of the teaching faculty is part of a Professional Development Group (PGP). These groups meet regularly across the school year to focus on improving teaching and learning in different areas. We are in the enviable position of being able to make up these groups with teachers from different school sections. This means ideas are filtered through many different lenses and a wealth of ideas, strategies and pedagogical practices are shared and embraced by teachers across the school. In the end, I believe it leads to an environment where there are more styles, approaches and levels of experience than there would be in a more traditional school. All of which, ultimately, gives rise to a less isolated education and enriches pupils’ learning and time at ISM. 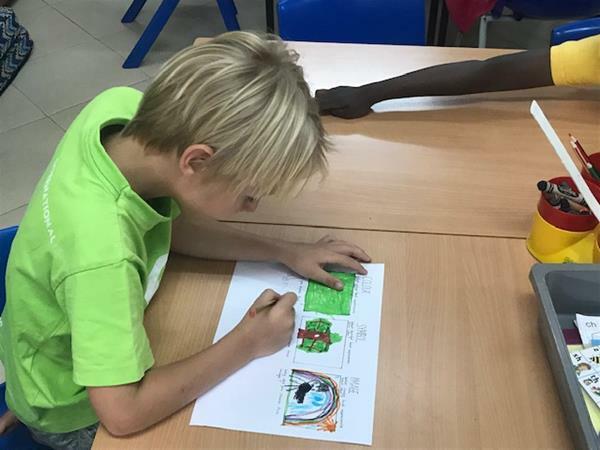 For example, if I understand as a Primary School teacher how the learning environment changes after P6, it can only help me prepare the students in my care for the styles and structures they will encounter. Similarly, if I appreciate as a Secondary School teacher how revisiting and incorporating “Primary teaching” methods and strategies can help support students through significant transition periods, I am far more likely to adopt them. Recent evidence suggests that, as a cohort of students transitions from Primary to Secondary School, up to 25% can experience a decrease in psychological health. This evidence alone highlights the need for increased dialogue across the phases. I see being an EC-D2 school as an unequivocal benefit to learning for everyone in our community. 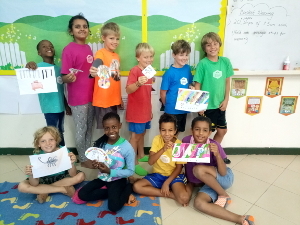 Of course, the different school sections follow very different programmes and there is limited scope for interactions during the academic programme but, elsewhere, there are significant opportunities for our youngest and oldest students to interact, connect and learn from each other. So, next time you see an MYP student walking a P1 student to their classroom in the morning, a D2 student carrying an EC friend around the 24 Hour run course or a D1 student supporting a Primary sports club, take a moment to recognise this and consider the mutual learning that is being nurtured and developed in that moment. 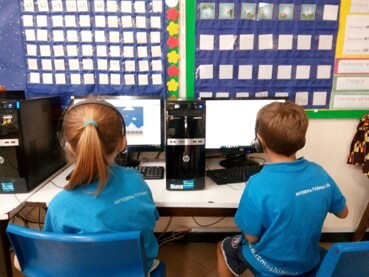 It was another week of learning and progressing through their studies for the DP students. All Extended Essay students are in the process of meeting with their supervisors for the third and final discussion about their extended essays. This is known as the viva voce, and will form part of the reflection documentation which will be submitted to the IB as part of the assessment for the Extended Essay. The SEP CAS group was treated to a celebratory dinner this week. A sumptuous meal of locally produced foods was shared and an opportunity to thank Marlies, who is the inspiration and driving force of this CAS, was taken. Another driving force of the SEP is stepping down from her role as group leader and handing on this responsibility to D1. We are indebted to Ejofon and thank her for her great work over the last 14 months. Good luck to Yuk Yi who will carry the SEP into its next project. Five of the hives put up last quarter are now populated. Students of the Simba CAS put on their aprons this week and baked up 300,000 Tsh in cake sales. This money will be used to fund activities led by ISM students and shared with the children of the Simba Foundation. Well done to you all. Our college counsellor, Mr. Rustad, returns to the Moshi Campus again from Sunday evening. He is available to guide and advise our DP students on their university choices and applications all of next week through to Thursday. Alberta University has a representative on campus on Thursday 15th November to talk to our DP students about the opportunities in that fine educational institution. On Wednesday 7th November a group of 4 students went to Kennedy House International School for the first inter-school Mathematics Challenge. 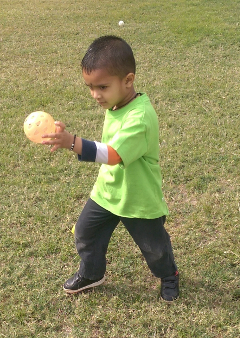 They participated in a variety of different rounds as team, in pairs and individually. There were questions involving number, algebra and shape. All rounds were different and students were given a chance to showcase their skills. Congratulations to all involved: M2 James, M2 Jemimah, M1 Nina, P6 Sahil. The M4 students will go to Kili West with students from Arusha campus on Tuesday the 13th November and return on Friday 16th November at 12:30pm. The trip is an interdisciplinary unit between Mathematics and Science. They will be accompanied by Ms Teresa Solero, Mr. Will Melhado and Ms Hilda Kashasha. The M5 students hosted Kibo secondary students on Wednesday as part of the familiarization with their peers. They are establishing a relationship with the school aimed at exploring avenues for future cooperation. 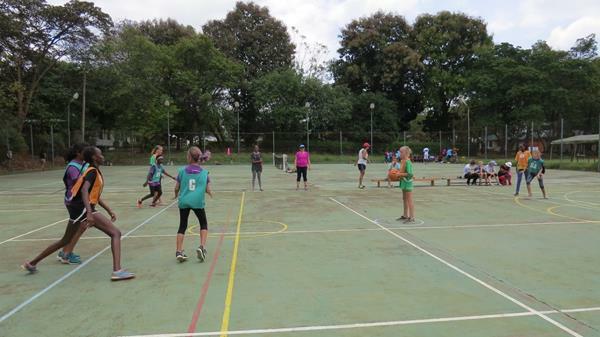 U15 netball took place last Saturday under a scorching Moshi sun. It was a challenging day with the girls playing 3 games back to back. The Leopards came in 3rd place after a great last game against ISM Arusha. A shout out to all the U-13 girls who played again this weekend with a special shout out to Lisa Manyama and Cecilia Lusato in M1 who reflected on their previous playing and showed huge improvement. Well done to Silipa Swai who was the Leopards’ MVP. The fun and sports action this week/weekend continued at ISMAC with the Primary Athletics on Friday the 9th November and the Secondary Athletics on Saturday the 10th November. Next week the action doesn’t slow down, on Tuesday the 13th November Kennedy House are hosting the U9 and U11 soccer and on Saturday the 17th we will host the U9 and U11 Rounders while our U19 Netball girls battle it out at St Constantine’s for the NTAA trophy. HELP NEEDED – ISM Sports Weekend is just about upon us, 23-25th November. As most of you will know it is a huge event in the ISM calendar and we will have anywhere from 1200 to 1400 people on the school grounds, with 9 different sports being played at the same time. Any assistance during the weekend would be greatly appreciated. 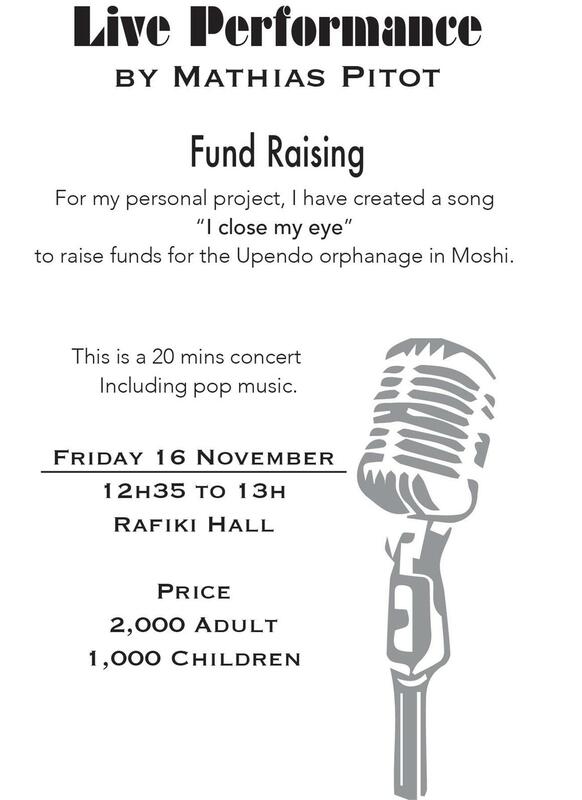 If you have time to help please contact me at robinmarsh@ed.ismoshi.com and make sure you make it down to support the ISM students too. Our swimmers seemed to have got into a nice rhythm of training with our next target in sight: 23rd, 24th & 25th Nov – ISM is hosting the annual Sports Weekend! 17 schools will be coming to participate. The gala is planned for Saturday afternoon and volunteers will be needed again to assist with timing etc. Please can you let Debbie or Christine know if are able to help out! Tomorrow, Maria Bachmann and Delhem Rashid will be flying to Dar to join up with the Tanzania National Swim Team who will be flying out to Khartoum/Sudan on Sunday morning to participate in the 3rd CANA Zone III competition. They will return on 19th Nov. We all wish them the best of luck!! 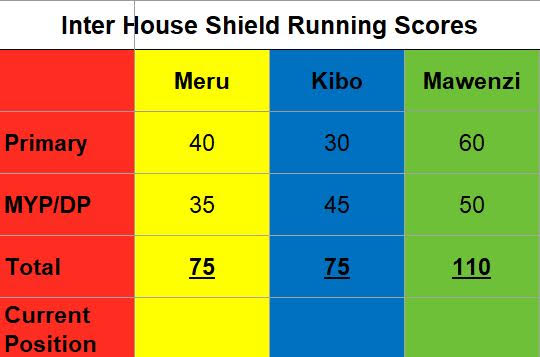 Congratulations to Mawenzi who proved to be the wisest house when it comes to know how to live a healthy life style, winning the all school quiz held in assembly on Monday. Here is the updated running scores. Starting last weekend, we changed the schedule on Sundays for boarders. Study time now operates during the afternoon before dinner. After dinner, they have a town hall meeting in the dining hall where the boarding community come together to share news. Any highlights from different dorms are mentioned, and then the boarders split to go to different areas as agreed by their boarding parents. After this, boarders return to their houses and have “family time” which could be discussions, game time or other activities. For Diploma students there is often addition study time that follows. Curfew times remain the same. Across the different Primary classes, the inquiries are really interesting, and the students are fully engaged while taking ownership of their learning. The sound of the songs from “Joseph’s Coat” as you walk outside the music room is so pleasing. The children are practising very well and are excited about the upcoming whole school production. We have gone full swing in embracing the developments from the IB as we launch the Enhanced PYP in our classrooms. What will it look like, sound like and feel like as these approaches are embedded in our practise? I will be sharing more during the Coffee Morning next week. On Monday 26th November, we have the PYP Sharing Assembly where all Primary classes showcase their learning through 5-minute presentations. We will start at 10:45am in Rafiki Hall and the sharing should run for a little over an hour. All primary parents are welcome. There is a house tug of war competition on Monday – please remind the children to wear their house shirts. Harvard ‘Project Zero’ specialists tell us that “Learning is a consequence of thinking, and developing a culture of thinking is critical if we want to produce the feelings, energy, and even joy that can propel learning forward”. Please take time to view our display board in the breezeway to find out about some of the thinking techniques we have been introducing this week. Agency is the ability to think and (most importantly) act in any given situation. Encouraging this should help prepare our students for the fast paced and rapidly shifting global environment into which they are taking their first baby-steps. A huge thank you to Baba Ima, who brought us a young African Blackwood tree to plant in our little garden this week. He shared with us the importance and special nature of this endangered species. Please remember swimming and library for everyone every Friday! Plants have continued to be the order of our week. The various groups chose one plant to focus on this week. They have amassed quite a bit of information concerning their plants. They will complete their work next week and move on to research one more plant. Our goal is to find out information about at least two plants in our chosen biomes. Information has begun to filter back to us concerning the projects ‘growing’ at home. We have various conditions being experimented on. 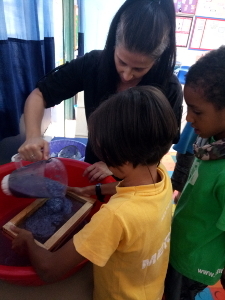 It is exciting to hear the children share their ongoing observations as they begin to form an understanding of what seeds need to grow and why. I encourage you to remind them to record their observation even through videos if they feel they cannot express their ideas fully in writing. If you are asked a ‘why’ or ‘how’ question, please let me know about it and we can explore more in class with everyone else. P 2/3 has had a colourful week exploring what meanings colours symbolize and how we can use them to showcase different times of the day. We have also been looking at using shading in 3D shapes. Students have played with watercolours and seen what happens when you add paint to a colour and when you add water to a colour. Students have had a crash course on 6 Tanzanian tribes, the Sukuma, the Hadzabe, the Chagga, the Pare, the Masaai and the Nyakyusa. We had Mr. Emmanuel from EC come in and talk to the students about the Masaai tribe and dance with the students. Furthermore, students have looked into changes in homes from the past, and how they differ based on their geographical location. Sadly we have been unable to construct our mud houses this week, the project is currently on hold pending acquisition of materials needed for the scaffolding. Congratulations and a big cheer to all the PYP athletes who competed at ISMAC on Friday! The P4 Inquirers have continued to make various investigations on materials and their different properties. We used Plaster of Paris to make a hand mould and we will continue next week. We also appreciate Ms Jaime from Secondary, for coming in and making paper with us. Over the coming week we will be summing up our unit by looking at chemical changes when materials react as well as matters of safety. We will also inquire into environmental issues caused by plastic and the alternatives we should put in place. In Maths the students will review the area of a regular polygon and learn how to find the area of a triangle. In Language we will be creating an information booklet on a chosen student invention as part of their Summative Assessment. This week the class continued to explore migration and began to plan the story line for their migration narratives as well as complete their personal migration story. 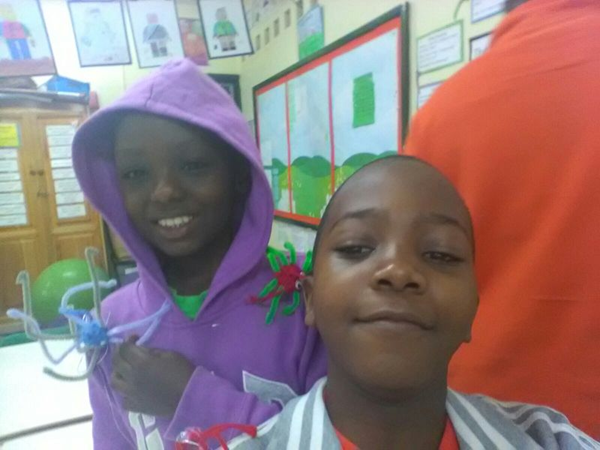 On the 26th of November we will have a Primary Sharing where they will share their Migration to Moshi stories. The class spent time this week creating their main character, and also thinking about the setting in the beginning and ending of their plot. In art, they drew how the setting will look at different stages of the migration route. In math, we introduced area with creating multiple rectangles that all had the same area, yet different perimeter. They also worked on symmetry with mirrors. Looking ahead, there is no school on Tuesday, the 20th of November. I would like to invite the class to have a small Thanksgiving Feast on Thursday the 22nd to share one of my favorite holidays in America. More details to come. balloons, elastic bands, wheels and axles but cardboard tubes and boxes should be brought in from home. There is a house tug of war competition on Monday – please remind the children to wear their house shirts.